Accompanying them was Walsall Football Club, one for the few non-manufacturing organisations to have embraced the campaign. The football club’s support has been recognised by the fact that Made in the Midlands has agreed to sponsor the club’s Community Programme in return for which, the club will promote the goals of the campaign to the wider community. 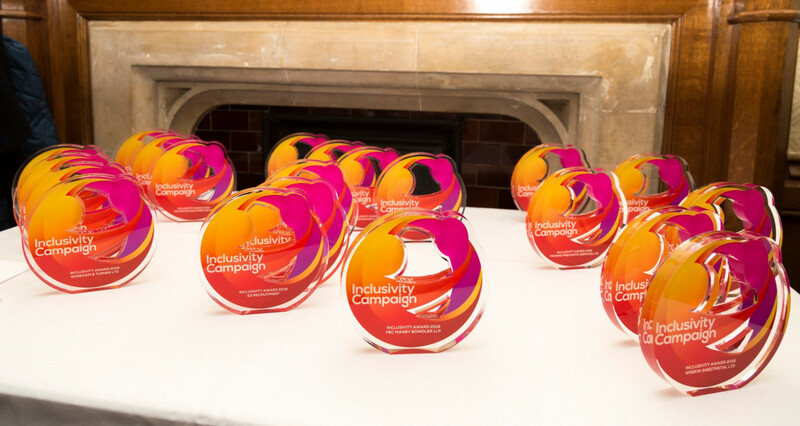 Commenting on the awards, Jason Pitt, CEO of the Made In Group, said: "This has been a tremendous first year for the Inclusivity campaign, more than 30 companies are now more inclusive employers, a by-product of course is they are improving the perception of engineering which in turn widens the recruitment pool whilst also improving productivity of the people already in their businesses." Linda Bates, of B Hepworth, said generating a Diversity and Inclusivity policy had been the first step implemented by the company to show its commitment to both its employees and customers. The Redditch-based group has been an enthusiastic adoptee of the Inclusivity campaign and Linda’s within the campaign has been recognised wit a promotion. Outlining the work completed by the company, she a quick win change for the business had been to relax working hours for mothers and the semi-retired. This has resulted in 7% of the company’s workforce no longer working a 40-hour week. “My appointment as Development Director is another positive commitment from the business (and) pushes forward the Inclusivity campaign,” she said. The company is also rewriting its Health and Safety induction to include any special requirements for disabled people or for risk managing the needs of employees who may wear clothing for religious reasons. Rowan Crozier, CEO of C Brandauer, said Inclusivity successes at his company had seen three directors trained as Mental Health First Aiders. In addition, himself and two of his managers have been trained in Inclusivity, with the result that he has been installed as an Inclusivity Ambassador. An Employee Inclusivity & Empowerment Policy has been developed and is under trial, including but not limited to company induction and a Brandauer training roadmap. Also implemented have been consultation reviews and workshops to involve colleagues across the business in key strategy development and a Personal Development Review (PDR) cycle that ensures one-to-one time is spent between managers and employees’ PDR. The Birmingham-based company has also pledged to widen its two-yearly pay benchmarking exercise to cover gender, race and age. Walsall Football Club is one of the few non-manufacturers to have embarked on the campaign. Nick Adshead, from the League One club, said that since joining the programme in September, the minds of staff had been re-focused on the needs and requirements to be inclusive in the workplace. “Our Board of Directors are also aware of the important part the club plays in the community and the need to be inclusive,” he said. Through its Supporters Trust, the club has a link with Sierra Leone where a lot of its used kit and equipment is sent to give others the opportunity to play football and to ensure they have football kits to wear when playing matches. Alongside this, kit and equipment is also donated to Walsall Ladies Football Club to ensure the sport is as inclusive as possible within the local community. “Both these initiatives ensure others benefit from the club. As a club we feel it's important to help organisations who are not as privileged to have as much money to spend on such things,” added Nick. Emma Anderson, of GKN Driveline, said that while her company was new to the Inclusivity journey, the business had plans to put its line managers through a Mental Health First Aider course in the New Year. The company is also revamping its recruitment strategy so that it can be more inclusive when searching for new candidates. The strategy will examine where the company advertises its roles to make sure it is reaching the right audience. Stacey Denton-Beaumont, of Boneham & Turner, said the company had been working with two recruitment agencies that specialise in placing ex-military personnel to further its goal of recruiting at least two shopfloor workers. The Sutton-in-Ashfield company has also hosted a meeting with the Ministry of Justice to discuss working with ex-offenders. As a result, it is looking at the possibility of staging a jobs fair within a prison, as well as exploring the possibility of using prison-based machining capabilities to support its own work. The company will also be carrying out an Employee Engagement Survey in January, with a view to developing new focus groups. Boneham & Turner is also developing all levels of its staff and putting cross-functional teams through Business Improvement Techniques Apprenticeships with the goal of putting 60% of the entire workforce through training by 2020. Stuart Hill, of Alphadrive Engineering, said his firm’s Inclusivity journey had helped to raise awareness levels within the business. He said management meetings had included a recruitment strategy, which was outside of the usual thinking. Managers and supervisors have added their own thoughts and ideas on bringing in fresh staff and how to integrate our needs with new starters. The approach had also helped the business deal more effectively with a worker who was struggling with depression. Julia Fitzsimmons, employment partner at law firm and Made in the Midlands Patron, FBC Manby Bowdler, said that while the firm had only recently embarked on the campaign it was already seeing positives. In addition to continuing successes in terms of gender mix, the firm is also aiming to have greater diversity within its higher management, together with greater representation of BAME groups in more senior positions as well as those from less advantaged social groups. Chet Parmar, of Colebridge Enterprises and a member of the MIM Inclusivity Advisory Board, said his organisation had agreed to take on three supported interns with learning disabilities and had recognised that his organisation’s board requires better representation. “We have actively networked to attract new female board members and are currently awaiting a response to an offer,” he said. “We have also successfully worked with two special schools to provide work experience opportunities for their pupils. The organisation is also working with its marketing company to ensure that all of its materials include the Inclusivity branding. “As a manufacturing sector organisation that helps people with disabilities and other other traditionally excluded groups into employment, we have used the toolkit to benchmark our own best practice and improve staff training across the organisation,” he added. Abi Lowe, of Mapal, said her company was also an Inclusivity novice but the campaign had already helped to highlight areas where the business needed to change. Likewise, Natasha Aaronricks, of Schmolz & Bickenbach, said the campaign had identified areas for improvement. “We have raised Inclusivity awareness throughout all levels of the business. This has been done through discussions with employees, putting up posters around the office and factory making Inclusivity more visible to all,” she said. The company has been keen to promote positive mental health and participating in the campaign has helped to further this goal. Being part of the campaign had allowed the organisation and its employees to be part of a group that is dedicated to tackling the stigma around mental health as well as promoting diversity and inclusion, she added. The next step for the company is to implement a full Diversity and Inclusivity policy and implement this throughout the business. Jane Billson, of Arlington Industries, said the company had embraced the campaign by sending workers from across its various sites on a sailing trip for the disabled, which it did in partnership with the Gwenilli Trust. The participants had been chosen for reasons of professional development and also as a reward for their hard work. On their return from the event, the participants helped to inspire colleagues and to strengthen team-building programmes. Emma Dolby, of Direct Air, said her firm’s Inclusivity journey had been both challenging and interesting. “We joined this campaign because we are passionate as a company to increase our inclusivity and diversity,” she said. “The first six months of this campaign, admittedly have been more of a learning and planning process than implementation due to the scale of the number of things we could get involved in. Claire Robinson, of Wrekin Sheetmetal, said participation in the campaign had been useful in raising awareness of mental health issues. She said it hadn’t always been an easy journey because there were challenges in making people understand why the company was participating. Nevertheless, she said once this had been explained then people were more receptive. The aim now is to continue to utilise the campaign to close the firm’s skills gap.